Home lighting design is a basic element to your interior design, yet it is oftentimes missed in the aesthetic layout when things are being arranged, furnished, and accessorized — but without the layers of optimal lighting, you can’t see the beautiful hardwood floors or the book you’ve been wanting to catch up on! Where do you begin with lighting design? The right kind of lighting illuminates a room while delivering a specific aesthetic. At Shelby Design Center, our lighting showroom can help you cultivate your space, layer by layer. 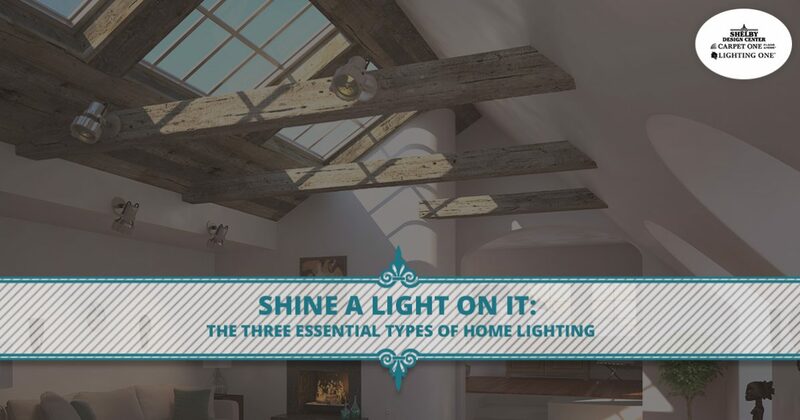 Learn more about the three essential types of home lighting. Most homes come equipped with overhead lighting in each room and some don’t go beyond that, but when you craft your interior lighting to fit the ambience of the room it can greatly shape and change your home’s energy. Let’s touch on the essential types of home lighting below. General lighting is the first, and all-encompassing, part of interior lighting design. This type of light is the most basic and functional and comes from natural outlets such as windows and overhead lighting. The need for general lighting serves as a functional component to lighting design — we need it to see around our home! While this comes standard in most homes, many times, people stop with basic lighting. This type of lighting is just that — used for projects and tasks. From reading and applying makeup, to cooking and working on a late night presentation, task lighting supports you! The best way to incorporate project lighting is to assess every room in your home — what are you doing in there? If you have a library, having little nooks with lamps with swinging arms is inviting and keeps everyone comfortable. 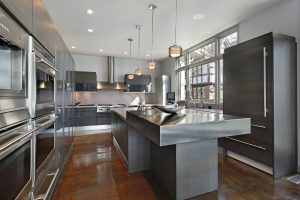 Or, if your passion is cooking, having a space that is well-lit, fashioned with lighting on the bottom of the cabinets or track lights that can help guide as you chop veggies, will make your job more efficient. It’s true, accent lighting sets the mood of a space, but it goes beyond that. If you are trying to set the right atmosphere and tone, accent lighting can influence the mood but it can also highlight specific features in your home and draw you into certain focal points. Similarly, it can also draw you away from blemishes and blunders in your home. When you incorporate each layer of lighting, you can create a depth of lighting design that is both aesthetically congruent and practical in your home. Many lights cross over into the different categories as wall sconces and chandeliers can double as both accent and general lighting, while recessed and track lighting can serve a function of all three when directed and installed with dimmers. It can be easy to overlook and forego lighting design when in the hustle and bustle or interior design, but because light plays such a crucial role in every space, adding each of the three essential types can help draw a focal point to the room, in addition to hiding away the things that should be unseen! If lighting design is a component missing from your Michigan home, work with us today — we’re here to provide you with modern lighting solutions.